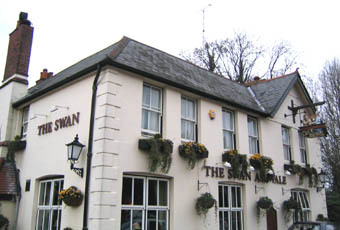 The Swan is a Chef & Brewer establishment hidden away along the canal, a little way off the main road through Ash Vale. With its location, it was predictably popular on a nice bank holiday Sunday, especially the outdoor area. Not everybody was there for their meals. Drinks were expensive and I've been to Chef & Brewer pubs with better selections. Nevertheless, they did have Courage Directors, Greene King IPA & Mucky Duck & Hop Art Hoppy Blonde. I later discovered a handpull with Westons Old Rosie just around the side. Service was very slow. One barmaid who was serving walked off after I had been waiting for 5 minutes. She obviously something more important to do. But then at least she could have at least apologised for having to walk away. Perhaps a little training is in order. Nice enough chain pub spoiled by poor service and high prices. I visited this pub for a meal and a pint, the beer (6X) was nice and my friends enjoyed their Bombadier however, it was quite expensive when compared with some of the other local pubs in this area. The staff were very attentive and accommodating, the service was quick even though the pub was packed to the hilt with people eating meals and there was a large group having a leaving drink. My burger was OK, not quite what I expected for the �9.50 that it cost and my friend scampi was rather a mean potion for what it cost. This is an ok pub but I am always disappointed when I visit - perhaps because it is hyped up so much by others. Yes, it has 6 handpumps for real ales but these invariably serve bitter, so no choice of beer styles! I have also often found my first choice is not available, but the pump clip is not turned nor is there any other indication the beer is not available. Food is over-priced for what you get. This is something people rave about but I've had meals which look like they could come from any chain pub, where you could buy the same thing for half the price! The pub is often very busy. I have generally found staff at the bar cope well with taking orders as quickly as possible, but sometimes there is a delay in receiving the food.